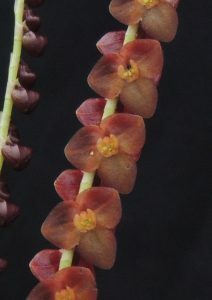 Stelis is a genus closely related to Masdevallias and Pleurothallis. They are not widely grown in collections but the orchid project has been a big fan since exploring the forests of Brazil and Costa Rica where students came across many of these small flowered but very attractive species. Stelis genychila like most Stelis species has flattish flowers with three larger sepals, forming a triangle, and much smaller petals and lip in the centre. These parts are easier to spot in Stelis genychila than many stelis species as the flowers are rather large and beautifully coloured. 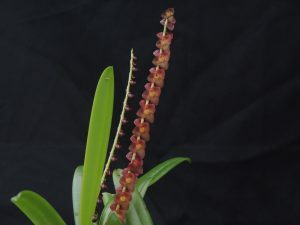 The plan is medium sized for a stelis with leaves about 20cm long and the 30cm flower spikes have two opposite rows of 10-14 flowers. Leaves flower repeatedly over many years and so mature plants produce many spikes. We find that this species flowers reliably from December through to March. Stelis genychila is endemic to Colombia where it is found at around 2300m in cool cloud forest.